If you have upgraded recently to use the latest versions of Internet Explorer 10 or Internet Explorer 11 you might notice some issues when using Cognos BI Studio. This can be caused by some enhance security settings that are included. Often these issues can be resolved by configuring IE 10 & IE11 to use Compatibility mode. 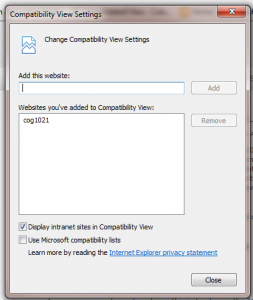 How to Configure Internet Explorer 10 and Internet Explorer 11 to be in compatibility mode. In Internet Explorer, if the compatibility View button is available, this looks like a broken page icon in blue, click on the icon.